After a long night of indulging in the state of Illinois' best bars and best burgers, you're probably only gonna want one thing: ibuprofen. But since it's super boring to make a list of the best ibuprofen in Illinois, we've got the next best thing: a list of the state's best diners (not in Chicago, 'cause you already know all of those, remember?). It’s a big state and there’s lots to cover, so let’s get to it, shall we? 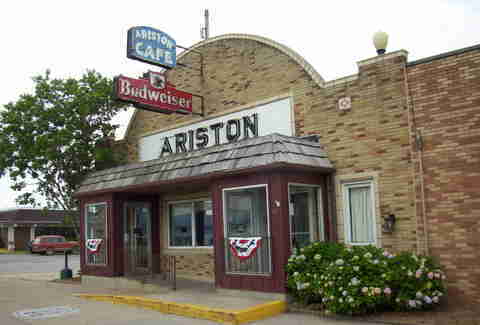 From baklava and gyros to toasted ravioli and halibut steak, you’re not about to run out of options at The Ariston Cafe. 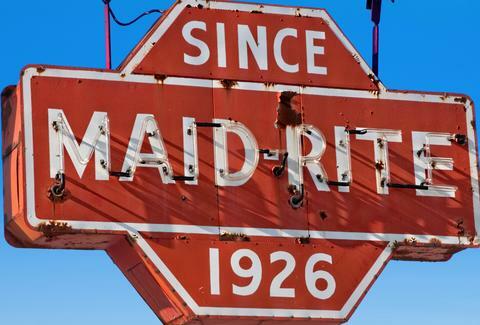 Originally opened in 1924 and often hailed as the best place to stop and eat when driving from Chicago to St. Louis, it’s even listed on the National Register of Historic Places. 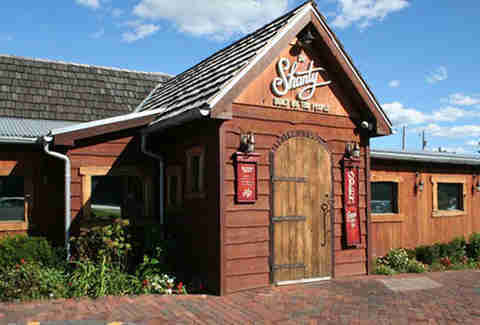 It's a great place to enjoy chimichangas and booze in a cool, small-town atmosphere. Some things never change, like overflowing coffee and hand-breaded fried chicken breast served with a chocolate shake. But at this classic ‘50s diner, there’s a twist -- as the sarcastic staff adds something extra to the meal. You can expect "sarcasm served all day", alongside crazy-good funnel cake fries (wut) and deep-fried cauliflower (for those health nuts out there). Already home to one of Illinois’ best burgers, Charlie Parker’s is a Springfield institution known for oversized pancakes and the legendary local specialty, the Horseshoe. This open-faced hamburger patty, topped with fries or tater tots and a special cheese sauce, can also be enjoyed with bacon, ham, pork tenderloin... hell, even walleye. Oh, and don’t sleep on the country-fried steak. Formerly Joe Rogers' The Chili Den Parlor, this local favorite has been a landmark in the Springfield community since 1945. You can customize the chili to your liking, adding your desired amount of beans, meat, oil, and more -- served either straight up or atop chili cheeseburgers and chili cheese dogs. Bonus: you can buy the stuff by the quart. 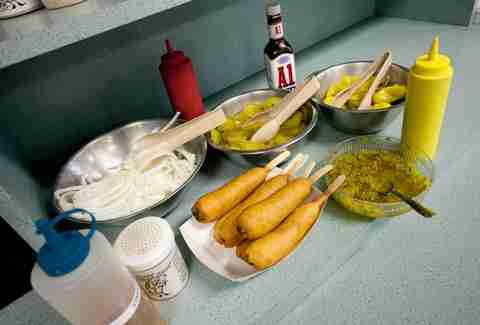 Similar to a corn dog on a stick, the one and only Cozy Dog (which they call "the famous hot dog on a stick” around these parts) is made from a local family recipe. This fabled Route 66 landmark -- born in 1949 -- even has its own gift shop, so you know it’s good. Indulge in some addictive hand-cut fries with your Cozy Dog and walk out with enough Route 66 swag to redecorate the man cave. This 1926 diner is well known around the Quad Cities for its famous Sloppy Joe-style loose meat sandwiches, or Maid Rites. Now a franchise with locations across the Midwest, the original is still a good place to enjoy thick malts, hand-cut fries, and classic ‘50s rock. If you’re into that sort of thing. Which, if you’ve made it this far into the article, you might be. 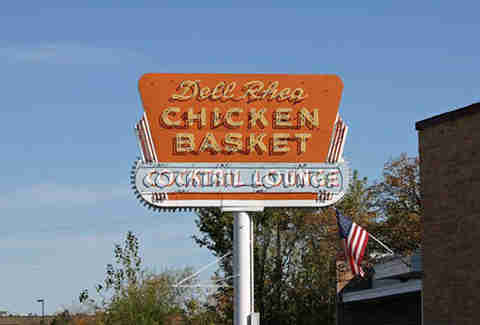 World famous for its fried chicken since 1946, Dell Rhea's lets you get your bird dressed up in all sorts of weirdly delicious ways, from Jamaican jerk wings to deep-fried chicken gizzards. Live bands and trivia keep the vibe lively and the chicken flowing, plus, hello, Dale’s Pale Ale and Abita Purple Haze on draft. This suburban Chicago institution has long been known for serving some of the best (/THE BEST??) hot dogs in the country. 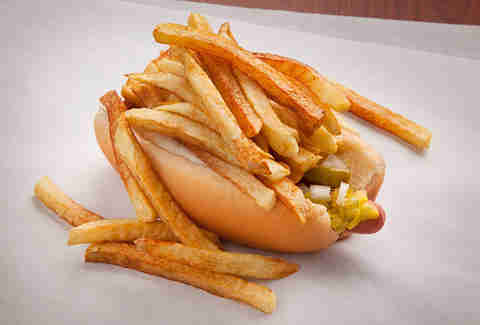 Get the chaotically fries-covered creation that is the double dog. It’s the Chicago way. Bonus: the tamales are pretty good, too. If you’re in Atlanta (IL, not GA), it’s hard to miss The Palms Grill Café (or The Grill, as locals call it). Just look for the giant "Tall Paul" statute of a dude with a massive hot dog and you'll know you’re close. Originally opened in 1934, the recently revamped cafe is serving up delicious and nostalgic dishes from Route 66’s golden age, including the well-recognized peach pies and old-school diner fare, like spam & eggs served with bottles of soda. Looking for something a little different from your standard diner experience? Instead of the usual steak & eggs deal, upgrade to more inventive fare at this rustic locals hangout that does whiskey shrimp, goat cheese wontons, and alligator tail. Yes, alligator tail. Consider it the new steak & eggs. A giant Elvis greets you at this popular Route 66 stop, where a fiberglass Marilyn Monroe and the Blues Brothers also hold court. Founded more than 50 years ago and "home of the famous chili cheese fries," it’s just like one of those old-school drive-ins you see on TV. Only for real. Grab a burger and an M&M shake. Obviously. Another Route 66 mainstay, Weezy’s is known for charbroiled burgers, homemade pies, and hearty breakfasts, particularly biscuits and gravy made with fresh sausage from locally produced hogs. 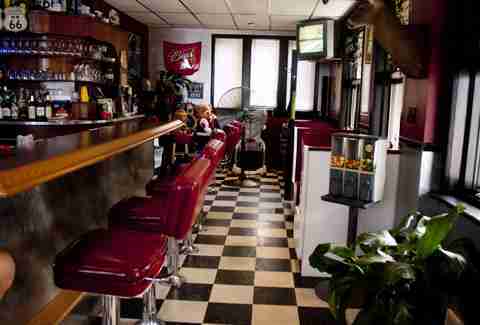 A black-and-white checkered floor, red vinyl seat cushions, and walls lined with vintage signs round out your classic Midwestern diner experience.